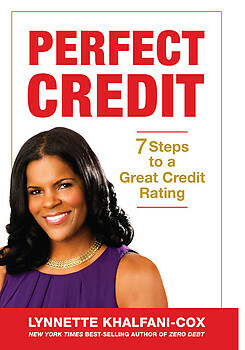 Perfect Credit: 7 Steps to a Great Credit Rating (208pp. ISBN: 978-1-932450-99-6 6 X 9) was another book and cover design project commissioned by Advantage World Press, Mountainside, NJ to AMV Publishing Services in 2010. The book is also authored by Lynnette Khalfani-Cox, personal finance expert, TV and radio personality, and the author of numerous other books including the New York Times bestseller, Zero Debt: The Ultimate Guide to Financial Freedom. Lynnette has appeared on such national TV programs as The Oprah Winfrey Show, Dr. Phil, The Tyra Banks Show, Good Morning America and various CNN programs on Personal finance and the economy. She has also been featured in top newspapers including the New York Times, Wall Street Journal, Washington Post, and USA Today, as well as magazines ranging from Essence and Redbook to Black Enterprise and Smart Money. As the credit crunch continues, a good credit rating isn’t good enough. You need perfect credit. The difference between having good credit and an outstanding credit rating can mean getting approved for a much-needed loan – or turned down for it. Moreover, with perfect credit you can pocket tens of thousands or even hundreds of thousands of dollars over your lifetime. That’s because people with excellent credit save money on loans of all kinds, pay less for various forms of insurance, and have better chances at getting hired or obtaining a promotion on the job. On the contrary, if you have blemishes in your credit ?les, or are trying to establish credit, you already know what a pain it is living with bad or “thin” credit: You get turned down for credit cards and loans, you pay sky-high interest rates when you do get approved, or you have to go (hat in hand) asking family or friends to co-sign for you or loan you money. The list of indignities you suffer with poor credit goes on and on. Perfect Credit is the de?nitive guide to getting and keeping outstanding credit. Roughly 220 million Americans have credit ? les maintained by the “Big Three” credit bureaus: Equifax, Experian, and TransUnion. Of those individuals, about 40 million Americans (roughly 1 out of 5), have very poor credit, or “deep subprime scores,” according to Experian. Another 50 million adults in the U.S. have no credit ? les – either because they’ve never used traditional forms of credit, or because their credit ? les are “too thin” to generate a credit score. Perfect Credit offers all these consumers an easy-to-follow blueprint on how to get superb credit – and how to sidestep numerous credit traps and pitfalls along the way. LYNNETTE KHALFANI-COX, The Money Coach®, is a personal ? nance expert, television and radio personality and the author of numerous books, including the New York Times bestseller Zero Debt: The Ultimate Guide to Financial Freedom. Lynnette has appeared on such national TV programs as The Oprah Winfrey Show, Dr. Phil, The Today Show and Good Morning America. Lynnette, an award-winning ?nancial news journalist and former Wall Street Journal reporter for CNBC, has also been featured in top newspapers including the Washington Post, USA Today, and the New York Times, as well as magazines ranging from Essence and Redbook to Black Enterprise and Smart Money. She can frequently be seen as a guest commentator on ABC, CNN, FOX Business Network and MSNBC.